Life with Aspergers: Book Review: We Said, They Said: 50 Things Parents and Teachers of Students with Autism Want Each Other to Know by Cassie Zupke. Book Review: We Said, They Said: 50 Things Parents and Teachers of Students with Autism Want Each Other to Know by Cassie Zupke. We've been through the IEP process many times for our kids. The IEP meetings we have now are fairly productive but both of my kids suffered for the first couple of years because we didn't have an effective working relationship with their teachers. As parents we had certain expectations and as teachers, they had their own agenda. My wife and I would often talk about how much easier things would be if teachers just told us their plans. Of course, at the same time, we didn't realize just how much we were leaving unsaid. "We Said, They Said" is a book in two parts. The first part contains 25 things that parents really wish they could say to teachers while the second is 25 things that teachers wish they could say to parents. Reading through these, I saw myself and my wife in many of these - and I reached a much better understanding of the motivations and pressures of the teachers. The book starts with an introduction which is essentially a seven page disclaimer. I'd strongly recommend reading it because it sets the scene and puts your mind in the right places. In this book, we leave political correctness behind for a while and spend some time looking at reality. It's well worth it. Of course, this also explains a little about why parents and teachers don't say these things to each other. Many of things they'd like to say could be taken the wrong way, many are politically incorrect and some things are downright illegal. Teachers have a lot of rules around their code of conduct which could land them in very hot water if they were broken. This book gives some great examples of how teachers try to communicate this information less directly. It also gives parents a few really great pointers on the types of questions that they can and should ask to get results without putting teachers in an uncomfortable legal position. The parenting section covers many of the hardships of raising a child with autism, the fears that parents have, their trust issues, they way they have been "burned" by professionals in the past and the challenges of acceptance and exhaustion. On the teacher's side, the book talks about how they really feel with special needs kids in the classroom, their difficulty coping with new challenges and the various ways in which parents of special needs children make their job so much more difficult. It's a fascinating and eye-opening experience which has helped me to understand many of the blunders I made during the IEP process. I'd strongly recommend that all teachers and all parents of mainstreamed kids with special needs (not just autism) read this book. It will completely change the balance of the IEP process and your relationship with the school. In fact, I can think of no better way to kick-start the school process for a new year and new teacher than to read this book and then give a copy to your child's teacher to read before your meeting. 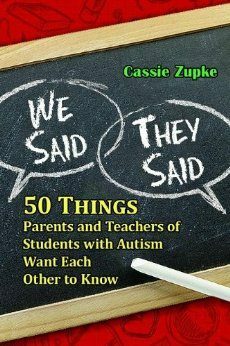 We Said, They Said: 50 Things Parents and Teachers of Students with Autism Want Each Other to Know by Cassie Zupke is an enlightening and breezy read with excellent formatting. It's available in paperback from Future Horizons and from Amazon. Honesty disclaimer; I was provided with a review copy of this book. Gavin, thanks for posting your review of this book. I'm going to share this article on my Facebook page.